I know you have all been asking me for updates on any news with the film. I have a little I can tell you about the screenplay. Over the summer I did what I thought was an impossible task: I cut a 220 page script to 150 pages, to make our Bronze Horseman movie 2.5 hours long. I managed to do this while leaving most of the things I love about the story in it. And then the best thing happened after the producer and director read the new version. They both said, that was good, but you’ve cut too much. Have any words been sweeter to a writer? We now need you to put stuff back, they said, and to write a new scene here and a new scene there, and reinsert this joke and this line and this character. Well, if you insist, I said. So that’s what I’m doing now. Once I’m done, the plan is to go into pre-pre-production in December and into pre-production in March. Dare we hope, production by summertime? So exciting – cannot wait!! Great news – really can’t wait! Would it be too much to ask you to request Henry Cavill as Alexander??? lol! So excited! This is my favorite book of all time. Seriously! In fact I own 3 copies. Hardback, paperback & kindle version. One of my co-workers and good friends is on a cruise now. Before she left, she asked if I could recommend a book to take. I told her I have JUST the perfect book. Can’t wait for her to return & tell me she loves it too. And now I can give her info on a movie version! Yay!! Oh my god I’m going to be sick. It’s wonderful news. I can’t wait that long!!!!! ahhhhhhh!!!!!! What a wonderful compliment for you, so excited!! This is wonderful news!!!! Yay!!!! I feel like crying!!! Overjoyed! Every so often I visit the trilogy, right now im reading The Summer Garden for the millionth time! Love these characters so much. Thank you Paullina, cant wait!!! Great news! I only ask you to to request em to be faithful to the book. I wouldn’t stand if they ruin such a precious book, story. This is one of my favorites ever. FANTASTIC news! I can’t believe they said to add more! That never happens! LOVE IT! The more Shura and Tatiana, the better!! Love it! The more Tatiana and Alexander the better! Thank you soooo much for the update Paulina!! Im so glad it is in the works , amd I KNOW it will be a perfect film. Im so happy you choose to stay true to the story and trust that even if you have to snip and cut at the story you do so in a way that still brings shura and tatia alive as we know and love them. *happy, excited tears* This book may have well been a true story for as real as the characters are to me! I CAN’T WAIT!!!! When casting please consider the following option. Do not cast a big name? We could all come up with names of “famous” people who fit the bill for us. But no matter who you cat there will always be disagreement. I have no doubts this movie will be a success, and that women the world over will flock to it & watch it more than once. Much as every person who has read your incredible novel has devoured it over & over. I have NEVER heard a baf word said about it. Oops hit submit before I was finished. So cast unknowns & then do not release the names or photos. Make people walk in to the cinema with no prior knowledge. As they did when they first opened the book. Let the audience fall in love with Tatia & Shura all over again without prejudice. All marketing prior to release should just have the actual Statue, & gardens etc. Amazing news!!! Happy dance!!!!! My wish came true!! Congrats Paullina! I’m so happy (& relieved) you’re writing the screenplay as you are an incredible storyteller. I read all three TBH books, while pregnant, in 2 days; I called in sick to work to do so, but in my defense, I was an emotional wreck!! TBH is my holy grail, I even named my son Alexander, my love!! As for casting, if I may put my two cents in, Isabel Lucas would make the most perfect Tatiana. She is exactly how I picture Tatiana to look like; innocent, delicate, sweet, beautiful. As for Alexander, good luck! I haven’t found him yet. Best of luck!!! I can’t wait to see TBH on the big screen. Fantastic news Faullina!!!!!!! A big kiss from Italy!!!! Fantastic news. I will be watching this on its first screening if I can. Can’t wait. So excited (: I’m sure it will be my favorite movie of all time – just as the novel is my favorite of all time! I just came across a new actress by the name of Erin Moriarty. She is exactly as I picture Tatiana. She may be worth looking into! Great news!! I really hope this film is a success and it is so great to hear that you are writing the screenplay – I was worried that it was going to become overdeveloped and hollywood-ised.. The actors, though, I think will play a big part in the movie success. Henry Cavill would look really good as Shura because he is so tall, dark, and handsome! For Tatiana though – I think the actress needs to be kind of unknown… And obviously small, pretty, blonde, thin, cheeky, intelligent, innocent, etc. Maybe she could have an English accent to reflect her European heritage? Or even a Russian accent? And Alexander an American one? Mia Wasikowska would be REALLY good as Tatiana! She’s an Australian actress and she was in the 2011 ‘Jane Eyre’ film if you wanted a reference. I think she would bring a freshness and innocence to the role and have the whole European look and feel – but you’d have to screen-test her to see if you like her. Brilliant news Paullina . Dreaming of Shura on the big screen. Just reread TSG again. You have so many fans in Brazil. I just LOVE your books. We are so excited about the movie news. In my opinion, I think DOUGLAS BOOTH will be a wonderful Alexander. Have you ever think about it, folks? Congratulations Paullina! I am so excited and am ‘waiting impatiently’ to see this movie!! I agree that Douglas Booth would be a great Alexander! Please please please don’t cast Henry cavill as Shura. He is a great actor, but he is not young enough or fresh enough for Alexander. OMG! Finallyyyy that’s great news!! The more Tatia and Shura the better <3. The mere idea of knowing who will be casted by summertime overjoys me to no end! Thank you Paullina! This is absolutely fabulous news Paullina! I am looking forward to the movie and can only hope I love it as much as this series! I am looking forward to the movie and really just can’t wait for it. Thank you Paullina for sharing with us such good news, and especially for sharing such a great love story like Tatiana and Alexander’s. I’m french and it’s also my favourite love story since I read it for the first time seven years ago !!!! I hope I could read all your books, because I also loved “The Girl in Times Square” and I’m about to buy “Six days in Leningrad”. So thanks again for that, I’m in love with your novels and I hope your success will be going on!! You deserves it!!! I have some questions I forgot. Where can I buy the book “Tatiana’s table” ?? Unfortunately I came too late when it was published… or someone could scan me a part of it? Best regards from France, hope you’ll come here one day!! I have loved your books. And am looking forward to a film adaptation. The Bronze Horseman is one of my favorite books of all times! I just got Tatiana and Alexander to read and am waiting for the third book in the series now. I’m excited about the movie, but I’ve never seen a movie that was better than the original book! Hope it is a great success. You are a wonderful writer. Have you thought of Eddie Redmayne for Alexander?? Watch the movie Birdsong! I’m so excited I stopped breathing for a minute there. Thank you for the update!! Wonderful news! I am so pleased you have maintained creative control over your film adaptation of the book. Casting hey! Don’t want THAT job! I have been searching for Alexander for over two years online and on all the streets of Melbourne and have come up with nothing. Henry Cavill could perhaps play Alexander in your third film The Summer Garden! He’s unfortunately too old for TBH Alexander. Someone here mentioned Isabel Lucus for Tatiana and I agree…perfect! Can I play the role of one of the villagers who stumble across Shura and Tatia half naked after doing the laundry in the Kama? Non speaking part, promise I won’t stuff it up! Please keep us updated! Great news! Oh wow I’m soooooo excited!!!! Hopefully it’s sooner rather than later. Congrats Paullina!! I first read TBH over 15 years ago when the male bookshop owner, in rural Victoria, Australia, recommended it to me. I’m forever grateful to him for such an amazing recommendation. I remember finishing TBH (a good year or two before the second book came out in Oz) on a Christmas day morning. Well I was so upset for the whole day. I felt like someone I knew and loved had died. I was balling my eyes out!!! A few years later I almost hugged the bookshop guy when I spotted TSG. Thank you so much Paullina for such an amazing story that’s so dear to our hearts. The best books EVER written, in my humble opinion. Couldn’t read again for ages after finishing these books because I knew nothing would ever compare ever again! Great job and can’t wait for the movie/s…..I actually said that this story would make a great movie and it actually will be now. Yay! I am so excited about this, I can’t actually wait! It was the best book I’ve ever read but I think any actors already in Hollywood shouldn’t really be cast. I think there should be an open casting and it would be more likely to result in the perfect casting of Tatiana and Alexander. Personally, I’ve always pictured Dasha to be Jessica Brown Findlay (Lady Sybil in Downton Abbey) and perhaps a Rupert Friend look alike as Alexander. So excited! Can’t wait. Best book of all time. Amazing news, the movie is going to be an epic! Is it just the first book? Will we be expecting others? I am beside myself with happiness! Absolutely the best early Christmas gift! I first read TBH last January. I’d never read anything of yours before. It changed my life – your writing changed my life. I’ve since devoured all of your books except for Tatiana’s Table, but it’s on my wishlist. Six Days in Leningrad made me cry all over again. It’s one of my favorite books of yours, and of any memoir I’ve ever read. Your writing is just absolutely exquisite. Thank you for sharing your gift, for inspiring so many of us. Thank you for writing. Oh my gosh, I screamed!! Please please please say they’ll film in St Petersburg!? I went there for my 24th birthday because of this book!! 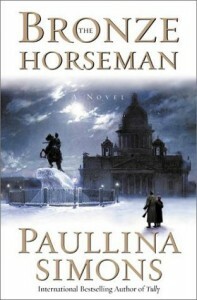 Thank you Paullina Simons for writing The Bronze HorseMan ,Alexander and Tatiana , and the garden summer . You can always do a 2 or 3 movie set to make it right and great! I trust that you, Paullina will ensure that the movie does not deviate from this glorious book. You have described everything so vividly that getting it wrong in the movie will be difficult. The trilogy as been the most touching experience of my life and i find it hard to believe Tatiana and Shura aren’t real. Alexander can only be played by Henry Cavill, anyone else will real break it. I am so excited ‘The Bronze Horseman’ is going to be made into a movie – I read this book every Summer and never get tired of it. I have also just finished ‘Bellagrand’ and loved knowing everything that happened prior to Alexander and his family being in Russia. I think I will now read ‘The Bronze Horseman’ again with these new insights into Alexander and his family. For the role of Tatiana, Australian actresses Samara Weaving and Margot Robbie might be worth a look!